Group messaging is one of those features that’s great when you want to be in a group conversation, and completely annoying when you don’t want your iPhone to be included in a barrage of group text messages. A new feature in iOS aims to relieve the latter situation, when your iPhone or iPad is being stormed by an onslaught of incoming messages from a group conversation that you just happen to be included in, allowing you to selectively mute a specific group chat in the Messages app of iOS. 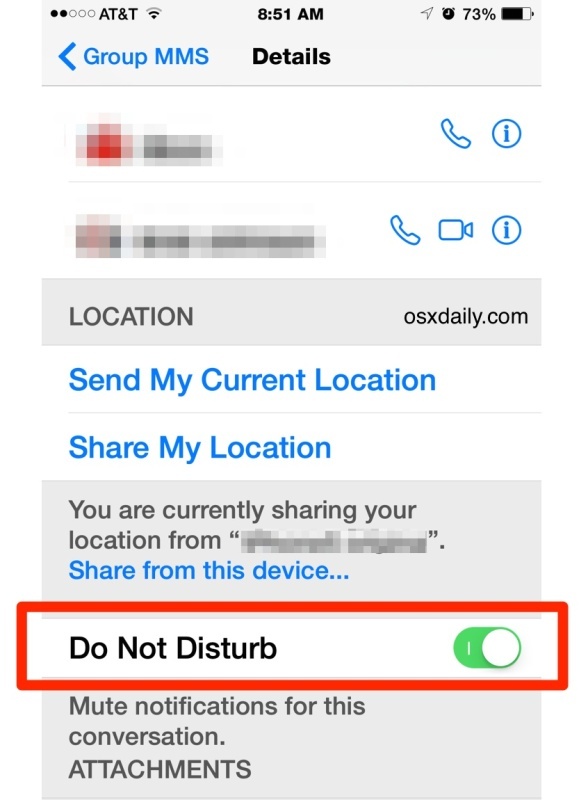 This is basically a message sender or message thread specific Do Not Disturb available in iOS, and it works great. Do note this feature is very different from leaving a group chat in Messages app, which actually prevents new messages from arriving from the opted-out group. The mute feature allows the messages to come through, they just don’t buzz and jingle your iPhone or iPad as they arrive. It’s actually a variation of the wider Do Not Disturb ability in iOS, but it’s applicable only to specific message threads where you have chosen to enable it, and the mute feature does not follow a timer like the wider DND feature can. Note this must be enabled on a per conversation basis, so muting one group message is not going to impact another group conversation. To end muting of the group conversation you have two options, you can either go back to the Details > Do Not Disturb option and toggle it OFF, or simply delete the group conversation thread. In the latter option, when a new group text arrives from the same people, it will no longer be muted. Or if you get overwhelmed by all inbound texts, you can always quickly toggle the feature through Control Center on a universal basis, or use Do Not Disturb on a schedule to give yourself some downtime. Didn’t know this is possible. iOS8 is full of new useful features I discover every day.